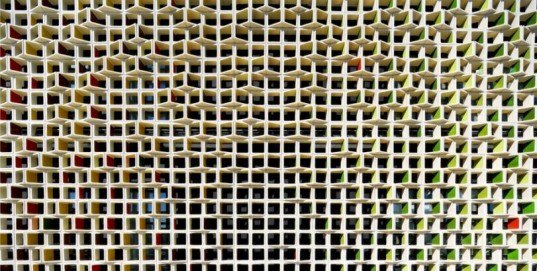 The Martinet Primary School in Barcelona, Spain boasts a beautiful multicolored ceramic tile facade that serves as an enormous sunscreen. 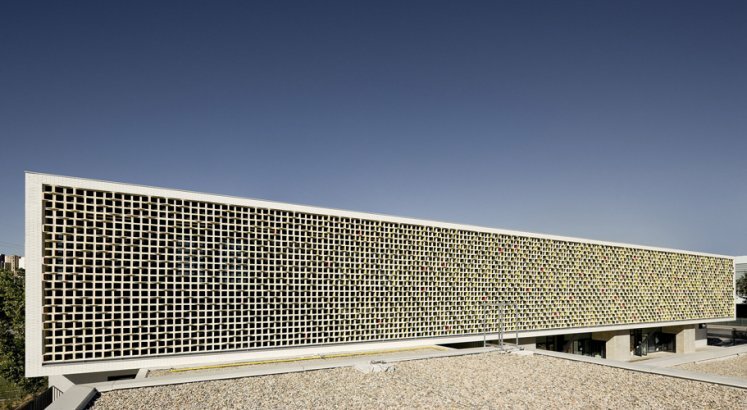 Mestura Architectes designed the building, which utilizes smart passive design to mitigate the harsh Spanish sun while encouraging natural ventilation. The building features a beautiful ceramic tile façade that shields the southern corridors, providing passive protection from the sun. The tiles are set at right angles to each other, and the sides facing the sun are glazed with brilliant hues to create a mosaic of color. Three shades of green brighten the west-facing sides, while three autumnal earth tones decorate the eastern face. The building was constructed using many durable materials – the tiles are vertically and horizontally joined together using 6mm diameter stainless steel rings to strengthen their form. Lime mortar joints contain an additive that provides enough elasticity in case of possible shrinkage. Built on a humble plot of land, the school is designed in a U-shape that curves around the playground – a typical layout for a public building of this kind. Classrooms for younger children face the south and lead directly onto the playground through a porch, while the primary classrooms on the upper floors face the north. Light, airy and protective, this building takes into account the necessity of providing shelter from the hot Spanish sun. Creative, artistic and utilitarian - I wasn't aware of this until I read this post. I'll be in Barcelona in a few weeks and check it out in person then. Thanks! The building features a beautiful ceramic tile façade that shields the southern corridors, providing passive protection from the sun. Each tile is no more than 300 mm thick, and they protrude outwards or inwards by 10cm, set at right angles to each other. The tiles are set at right angles to each other, and the sides facing the sun are glazed with brilliant hues to create a mosaic of color. Three shades of green brighten the west-facing sides, while three autumnal earth tones decorate the eastern face. The building was constructed using many durable materials - the tiles are vertically and horizontally joined together using 6mm diameter stainless steel rings to strengthen their form. Lime mortar joints contain an additive that provides elasticity to prevent shrinkage. Built on a humble plot of land, the school is designed in a U-shape that curves around the playground - a typical layout for a public building of this kind.